Centrally located at the corner of Denny Way and Westlake Avenue N., the South Lake Union Discovery Center is ideal for your community event, private party or corporate function. The Discovery Center is a stylish, flexible facility that offers a modern backdrop to complement your event—indoors or outdoors! The Discovery Center also offers a display devoted to the area’s history, information about places to do business, an interactive model of the entire neighborhood and helpful staff to guide you. To schedule a walk-through, check availability and get a quote for your event, call the Discovery Center at 206-342-5900 or email events@discoverslu.com. You can also take a virtual tour here! Please visit our business page for additional information. South Lake Union is a neighborhood with a distinct live-work-play culture. By day, you’ll see streets bustling with everyone from biologists, to tech mavens and their furry friends. They’ll be visiting the Pike Place Market Express market for fresh produce during their lunch hour, or swinging by a Pronto bicycle-sharing station en route to their next stop. At night, the robust dining scene attracts locals and visitors alike. And when it’s time to play, the options are endless. The walkable neighborhood is home to many events including the annual South Lake Union Block Party. Attractions like the REI flagship store’s indoor climbing wall and watersports at Lake Union Park keep you happy and healthy. And that’s just the start. 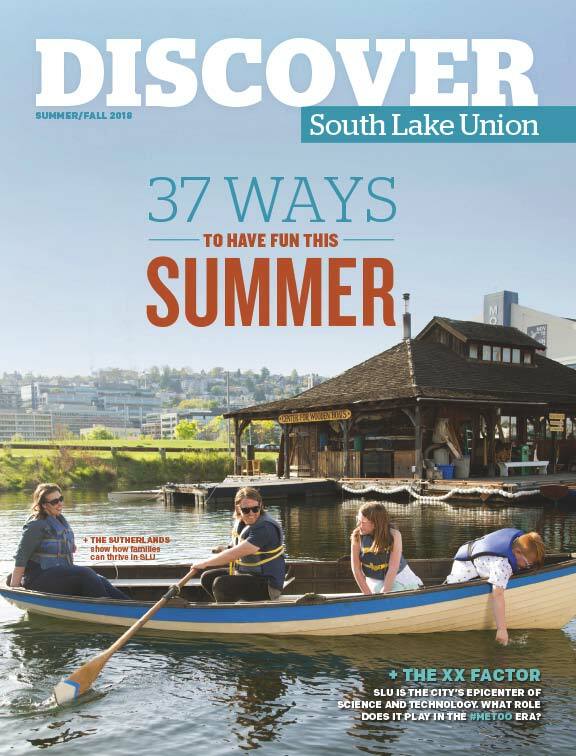 You can stay up to date about all that South Lake Union has to offer by subscribing to the Discover SLU eNewsletter. Although South Lake Union had humble beginnings, innovation was always a core value of the neighborhood. From sawmills fed by floating logs, to industrial pioneers, big thinkers shaped the area. 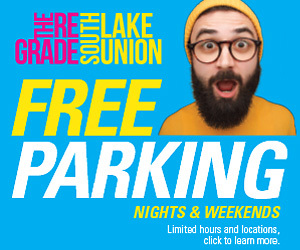 This didn’t stop when Microsoft co-founder Paul G. Allen invested $30 million to kick-start an effort to acquire land in South Lake Union to fulfill the City of Seattle’s vision of the Seattle Commons, a massive park which would run from the downtown core to Lake Union. Although the measure was not approved, Allen shifted gears, formed Vulcan Real Estate and developed the acquired land into what you see today. South Lake Union is now home to a diverse mix of retail businesses, office buildings, condominiums and apartments, all designed with an emphasis on walkability, excellent public transportation and sustainable design and construction. The neighborhood was even designated as one of seven Innovation Districts in the United States by the Brookings Institute because of its emphasis on connectivity, technology and community. South Lake Union is a unique neighborhood within the City of Seattle, comprised of 170 acres of parks, community amenities, LEED-certified commercial and residential buildings as well as lakefront access and a myriad of alternative transit options. Both residents and business owners are drawn to the neighborhood because of its pedestrian-oriented infrastructure and modern approach to place-making. Public art, pocket parks and historic buildings provide tranquility and a rich culture. From retail, to life sciences, to tech startups, the one thing all businesses in South Lake Union have in common is a desire to innovate and evolve. We’re still growing, and you can join us. Contact Vulcan Real Estate’s Office and Retail Leasing department at 206-342-2000, or email geralynv@vulcan.com to discuss opportunities.